DIY Neuroprosthetics: A Third Thumb? Several months ago, a crowdfunded classroom got their hands on several of our neuroprosthetic kits – like The Claw and the Muscle SpikerShield Bundle. This allowed students in Nokomis Regional schools to begin experimenting with hands-on neuroscience experiments! 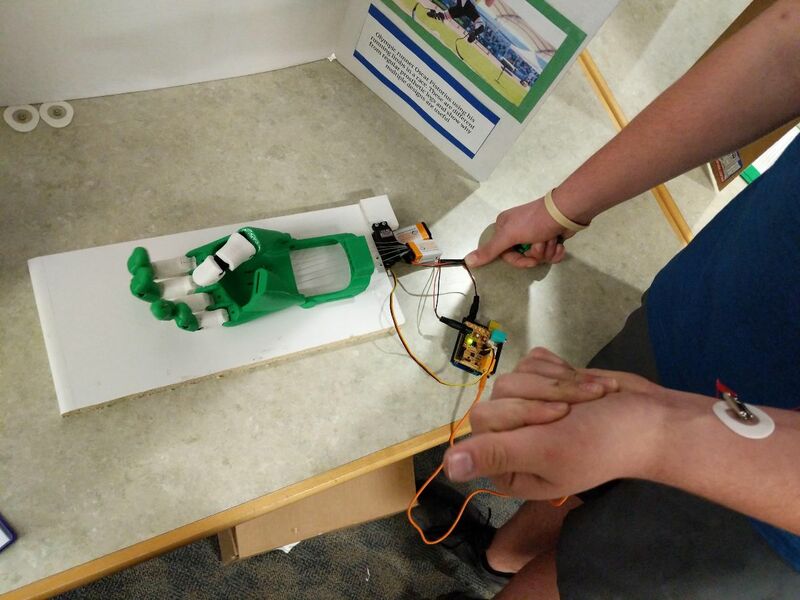 One of the students, 8th grader Kaiden K., was interested in developing a prosthetic, but his project had a twist question: What if we had a third thumb? Kaiden’s project is twofold: First, it is a project on the history of prosthetics. From wooden hands to mechanical prosthetics, and now modern, low-cost DIY prosthetics, there have been a lot of remarkable developments along the way as we strive to create new opportunities for people to bring mobility and ability into their lives. Using a 3D printer and the tools his teacher had crowdsourced on Donor’s Choose, Kaiden was able to develop a neuroprosthetic which anyone can plug into and control with their brain! 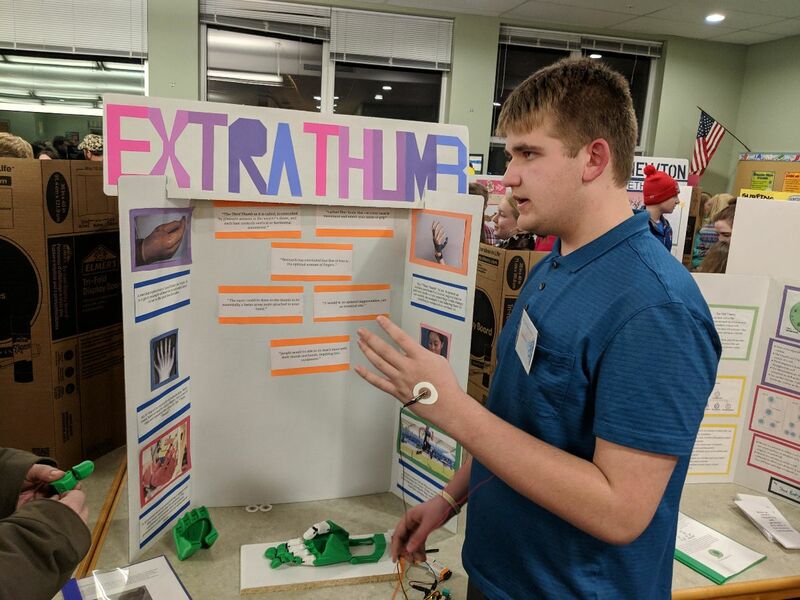 By recording from their muscles, Kaiden is able to put other students at the science fair in control of the prosthetic hand. The second part of the project is still underway: developing a neuroprosthetic which anyone can wear which augments typical human ability and mobility, by adding the third thumb! To put it fantastically: Kaiden is developing cybernetic human enhancements. Literally, 8th graders are contributing to helping us become cyborgs! Too cool. In an example of parallel, historic discovery – Kaiden had the idea for an extra thumb and began his RnD… then just like many other great minds, discovered he wasn’t the only one doing this work! 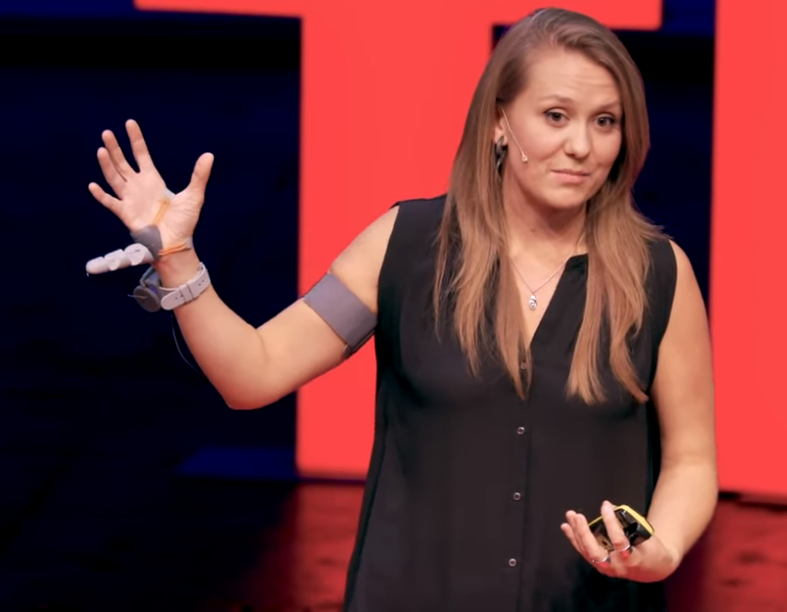 This idea has been explored by prosthetic designer Dani Clode – she gave a TEDx talk which is also a great watch! See her TEDx talk here to learn more about the Third Thumb project. We’re excited to see Kaiden further refine and develop his project. Kaiden wants to investigate multiple degrees of freedom, perhaps 2-axis control, and see what he can develop. We’ll be sure to update you as he continues experimenting! 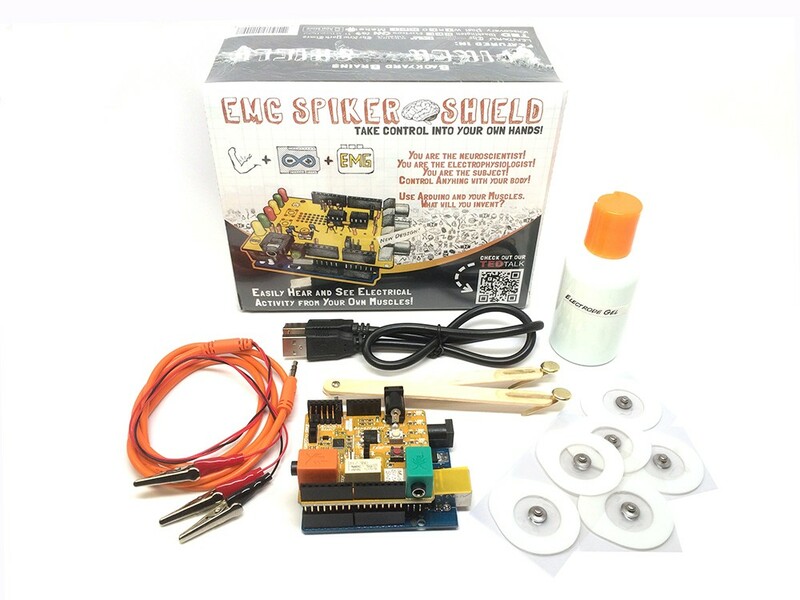 Develop your own Neuroprosthetics using the Muscle SpikerShield! Help us win a Grant to Empower a New Generation of Sports Scientists! Through our adventures at Backyard Brains over the years, we have come to love electromyography, muscle coordination, and the body in movement. We have already begun some classes where we teach muscle physiology through sport! We recently applied for a grant to devote more resources to this new area for us. We made a quick and dirty video under deadline at a local school, and to move to the next phase of the competition, we need eyeballs and likes. Help us out with your screens and your thumbs if you want to! This is to further develop our fledgling work into making quantitative sports-science an accessible field of research for K12 students! We’ve tried three sports so far, all favorites of Backyard Brains: baseball, basketball, and soccer. For baseball, we attached electrodes to the triceps while students threw the ball at greater and greater distances. However, the act of throwing a baseball is so violent and fast that the cables would always fly off, making an unstable interface, to put it mildly. We next tried basketball, with muscles again on the triceps, but our students were pretty young, around 11-13, and they had a hard time launching the basketball with enough force (and good form) to actually reach the basket. Even on adults like ourselves, we did not notice an obvious difference between 2 point and 3 point throws. Our last attempt was with soccer. We placed electrodes on the quadriceps, and we had markings on the outside gym floor with masking tape of 5 ft, 10 ft, 15 ft, 20 ft, 25 ft, etc. With this experiment, it was very obvious that the EMG amplitude of the quadriceps contraction increased with the greater distance that the students had to kick the soccer ball, teaching about motor unit recruitment and electrophysiology in a very entertaining way. Learn more about the experiment and the results here! We have on experiment up currently which teaches students how to study and model Rates of Muscle Fatigue – this is a great intro lab as it can be modified and applied to many sports labs! There are numerous examples of sports scientists using EMG activity to study the efficiency of different movements, the relationships between strength and endurance, and the difference between skilled and unskilled athletes! We want students who are passionate about their sport to contribute to this body of knowledge, and we want to provide affordable and accessible tools, along with free introductory resources so they can get started running (literally!) Weightlifting, rock climbing, football, futbol, gymnastics, tennis, baseball, shuffleboard… the possibilities are limitless! This is just the beginning, and we will continue looking for ways to incorporate sport into our physiology experiments, as it makes teaching at the middle and high school very engaging. We would all rather be outside and move our bodies than sit at a desk, anyway. We’d encourage you to watch the youtube video we linked above, and if you love this project, please like the video! It will help us to win this funding and help bring the experiments to life.